ixigo is giving you an exclusive chance to win ₹1000 Paytm Cash. All you need to do is link your Uber and Ola accounts to the android version of the ixigo Cabs App. 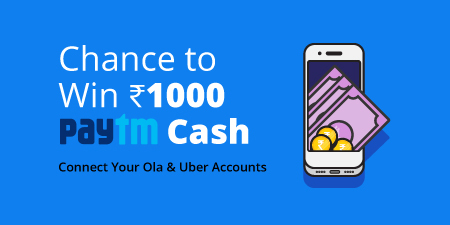 One lucky user from the eligible participants gets a chance to win ₹1000 Paytm Cash everyday. We will inform the winner via email & phone (those provided at the time of connecting your accounts) by 8PM of the next day. NOTE: If you’re an existing user You will need to Update Your App before you proceed. *ixigo reserves the right to select the winners and change the offer rules at any given point of time.